Woke up this morning with a hankering to do some shadow boxing and jump roping as cardio. They say working out on an empty stomach first thing in the morning helps you burn fat as your blood sugar is constant and low from sleep so the body turns to fat stores for energy. From Dolph Lundgren swimming or walking to Jean-Claude Van Damme cycling to The Rock Elliptical machine-ing it, empty stomach morning cardio has plenty of success stories. To begin, I opted for shadow boxing via one Bas Rutten, a tough yet hilarious Kickboxer turned MMA champion from the Netherlands. I'm not sure when he released his workout series but I've had mine since the mid 2000's. It contains four separate workouts: Boxing, Thai Boxing, All-Around Fighting and All-Around Workout. I remember doing these years ago when I had a full workout space complete with punching bags and they were very hard but a great workout. If you've never had your shirt completely soaked through with sweat, try these bad boys sometime. If you do the full workout, it's only about 30 minutes but you will be wiped out. Warming up with 50 jumping jacks and 50 mountain climbers, I jumped into 2-minute rounds of Boxing and completed 6 of the 10 as I wanted to save some energy for jump rope as well. The tapes also provide 3 minute rounds when you're ready. Then it was time to jump rope so I put on some Youtube clips of Andy Hug, the Swiss Kyokushin karate champion turned K-1 kickboxer Grand Prix winner who sadly died at 35 from leukemia. Hug was always in great shape: muscular, proportioned and cut to pieces. There were plenty of matches, workout montages and greatest hits (literally) on Youtube to keep me occupied and motivated while skipping rope in my living room. Again, I went for 2 minute rounds jumping in sets of 50 until time was up. You can jump rope a million different ways and they say it's 3 times the workout of running. So if you jump rope for 10 minutes, it's like a 30 minute jog since you're always moving and using your calves, quads, core, arms and shoulders throughout. To spice things up, I started some rounds with a set of jumping backwards and in another I threw in intervals at 20 seconds working and 10 of rest. In between rounds I did some ab work with reverse crunches, twists and the good ol' ab wheel. 6 rounds of that and I was feeling light and tight, ready to face a day of lounging. One of my favorite matches of Hug's was against Stan "The Man" Longinidis, a computer programmer turned Kickboxing champion from Australia. I had heard of The Man because he broke the leg of American champion and Van Damme co-star in Kickboxer, Dennis Alexio. 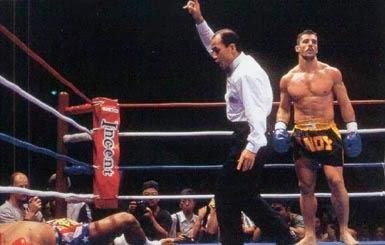 Longinidis utilized a Muy Thai style that relied on vicious low kicks and the two came out fast and furious, winging high velocity kicks and punches at each other before almost falling out of the ring. Hug would win by Knockout after softening Longinidis up with a cracking head kick followed up by a perfect left straight right down the middle that laid The Man flat out on the canvas.